WHAT IF RECORDS GREW ON TREES? Apollo 14, humankind's third great voyage to the moon across the black desolation of planetary space, landed the lunar surface in February of 1971. As astronauts Alan Shepard and Edward Mitchell strolled the dusty, lifeless craters of Earth's most faithful companion, astronaut Stuart Roosa, formerly a U.S. Forest Service worker, awaited the safe return of their lander in a tiny spacecraft orbiting in the moon's empty sky. As part of a Forest Service research project, packed into small containers in Roosa's personal kit were hundreds of tree seeds. Together, man and seed circled the moon every few hours. Upon return to Earth, the seeds were tenderly cared for and planted through out the US -and the rest of the world. Today these pines, sycamores, and redwoods stand as a testament of the fertile, mysterious intersection of technology, human spirit, and the great Other. They are known as the "Moon Trees." 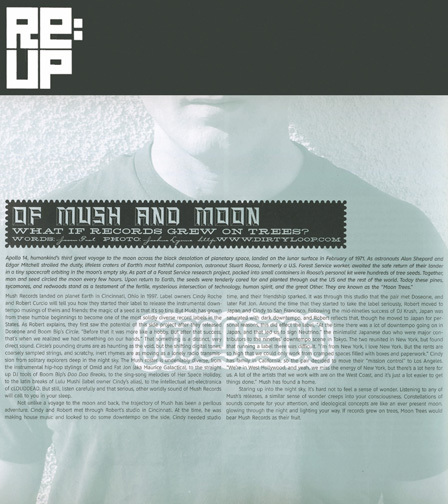 Mush Records landed on planet Earth in Cincinnati, Ohio in 1997. Label owners Cindy Roché and Robert Curcio will tell you how they started their label to release the instrumental downtempo musings of theirs and friends; the magic of a seed is that it's so tiny. But Mush has grown from these humble beginnings to become one of the most solidly diverse record labels in the States. As Robert explains, they first saw the potential of this side project after they released Doseone and Boom Bip's 'Circle', "Before that it was more like a hobby. But after that success, that's when we realized we had something on our hands." That something is a distinct, very direct sound. 'Circle's' pounding drums are as haunting as the void, but the shifting digital tones, coarsely sampled strings, and scratchy, inert rhymes are as moving as a lonely radio transmission from solitary explorers deep in the night sky. The Mush roster is undeniably diverse, from the instrumental hip-hop stylings of Omid and Fat Jon (a.k.a. Maurice Galactica), to the straight up DJ tools of Boom Bip's 'Doo Doo Breaks', to the sing-song melodies of Her Space Holiday, to the latin breaks of Lulu Mushi (label owner Cindy's alias), to the intellectual art-electronica of cLOUDDEAD. But still, listen carefully and that serious, other worldly sound of Mush Records will call you in your sleep. Not unlike a voyage to the moon and back, the trajectory of Mush has been a perilous adventure. Cindy and Robert met through Robert's studio in Cincinnati. At the time, he was making house music and looked to do some downtempo on the side, Cindy needed studio time, and their friendship sparked. It was through this studio that the pair met Doseone, and later Fat Jon. Around the time that they started to take the label seriously, Robert moved to Japan and Cindy to San Francisco. Following the mid-nineties success of DJ Krush, Japan was saturated with dark downtempo, and Robert reflects that, though he moved to Japan for personal reasons, this did effect the label, "At the time there was a lot of downtempo going on in Japan, and that led us to sign Neutrino," the minimalist Japanese duo who were major contributors to the nineties' downtempo scene in Tokyo. The two reunited in New York, but found that running a label there was difficult. "I'm from New York, I love New York. But the rents are so high that we could only work from cramped spaces filled with boxes and paperwork." Cindy has family in California, so the pair decided to move their "mission control" to Los Angeles. "We're in West Hollywood, and yeah, we miss the energy of New York, but there's a lot here for us. A lot of the artists that we work with are on the West Coast, and it's just a lot easier to get things done." Mush has found a home. Staring up into the night sky, it's hard not to feel a sense of wonder. Listening to any of Mush's releases, a similar sense of wonder creeps into your consciousness. Constellations of sounds compete for your attention, and ideological concepts are like an ever present moon, glowing through the night and lighting your way. If records grew on trees, Moon Trees would bear Mush Records as their fruit.